A leafy head looking down on visitors to the last gallery of the Getty Villa exhibition Heaven and Earth might have migrated to Los Angeles from a Gothic cathedral. What is he doing in an exhibition on Byzantine Greece? The “Green Man,” a male figure with foliage sprouting from his face, is as popular today—see the recent film The Odd Life of Timothy Green—as he was in the Middle Ages. For centuries, these images of men entwined with nature were found in both religious and secular buildings. 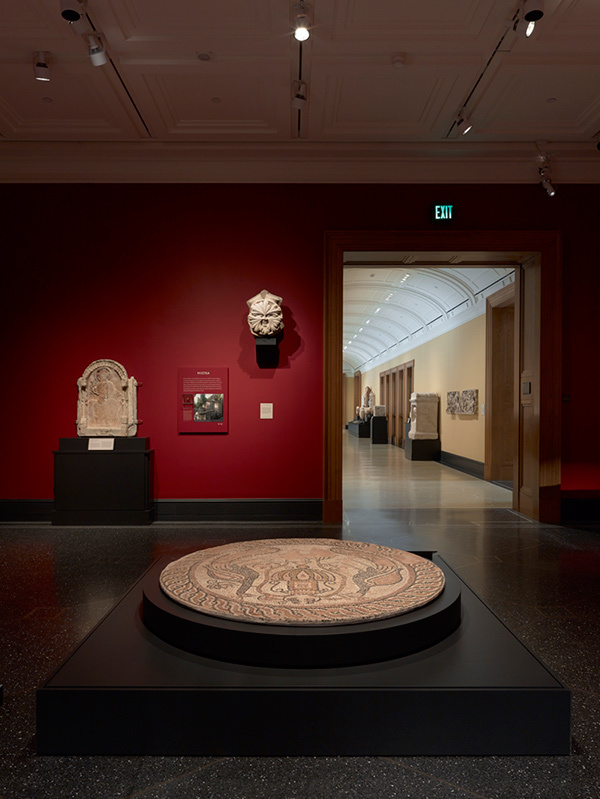 The thirteenth-century Green Man on view in Heaven and Earth: Art of Byzantium from Greek Collections has the distinction of having once protected a Latin church in Greece. Covered by broad leaves that obscure a watchful face, this Green Man was a witness to a time when French crusaders settled in the Morea (the Greek Peloponnesos), bringing artisans and artistic styles from their native land. Inside the galleries of Heaven and Earth at the Getty Villa. The Green Man (center) is installed high on the wall, alluding to its original placement above eye level. This piece was uncovered in surprisingly good condition during the excavation of the monastic church of Zaraka (Stymphalia). Capitals carved with abstract leaves were also found, but this Green Man is the only sculpted figure known from the site. He originally served as the keystone for a groin vault, the intersection of two arches. Placed at the height of the ceiling, he would have looked down on the monks gathered in prayer below. The monastic church of Zaraka lay in the Principality of Achaea, one of the so-called “crusader kingdoms” formed following the capture of Constantinople by Western forces in 1204. For most of the thirteenth century this kingdom was ruled by the Villehardouin family, who came to the Morea from the Champagne region of France. In 1225, Geoffrey I de Villehardouin petitioned the Chapter General of the Cistercians to send monks to establish a monastery in Achaea. This request was fulfilled by the abbot of Morimond and it is likely that the monastery of Zaraka was founded by monks from Morimond Abbey, which still stands as a ruin in northeastern France. 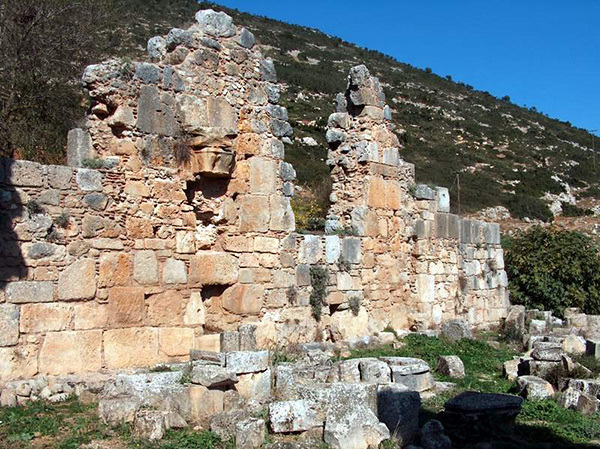 Unlike the other Cistercian monasteries throughout Greece, which reused Orthodox structures, the church at Zaraka was newly built according to a Western plan. The structure contains only right angles—no circles as in Orthodox architecture or curved chapels such as in Gothic churches—and features a square apse. This form is common for Cistercian churches, but is more typical of the architecture of the preceding century. Analysis of the masonry techniques reveals that local Greek masons built the church, suggesting an interesting story: the monks in charge of building the church may have relied on an older, simpler plan because they needed to work with local masons who were unfamiliar with Western building techniques. 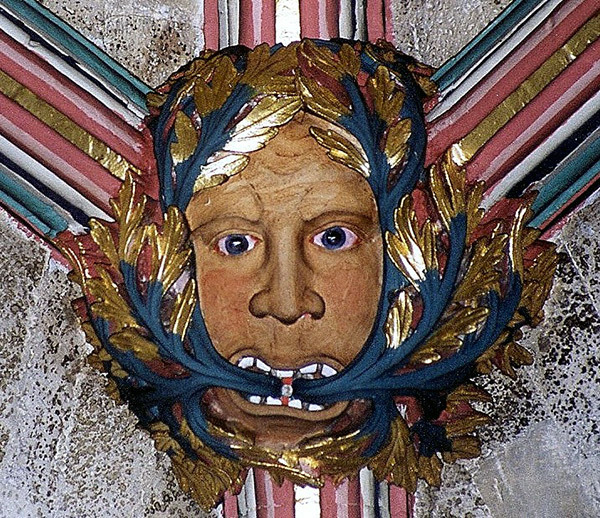 The inexperience of the local masons with Western design also explains why the monks brought artisans from France to produce the finer carved elements of the church, such as our Green Man. 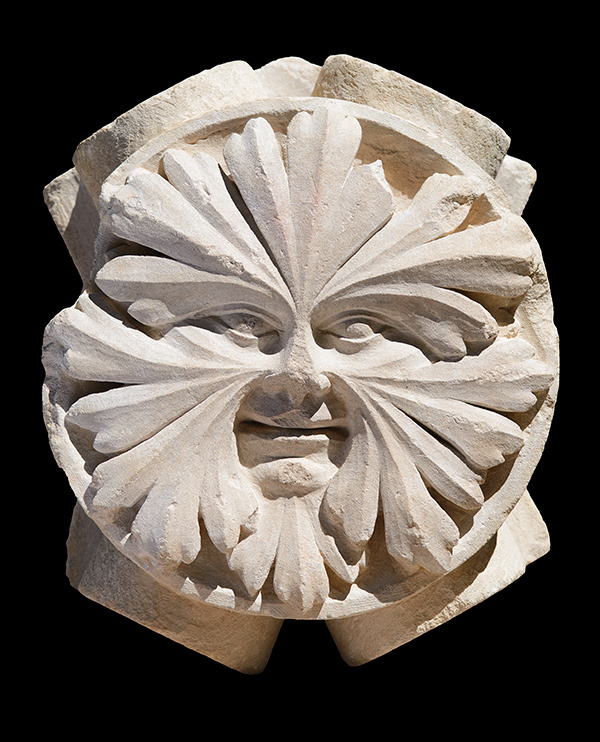 The Green Man may seem quite unusual, but the foliate face has its origins in classical imagery common to both the Eastern and Western Roman worlds. Sixth-century examples of similar faces, for instance, can be found in the collection of the Istanbul Archaeology Museum and derive from buildings in the Byzantine capital as well as others in close proximity. 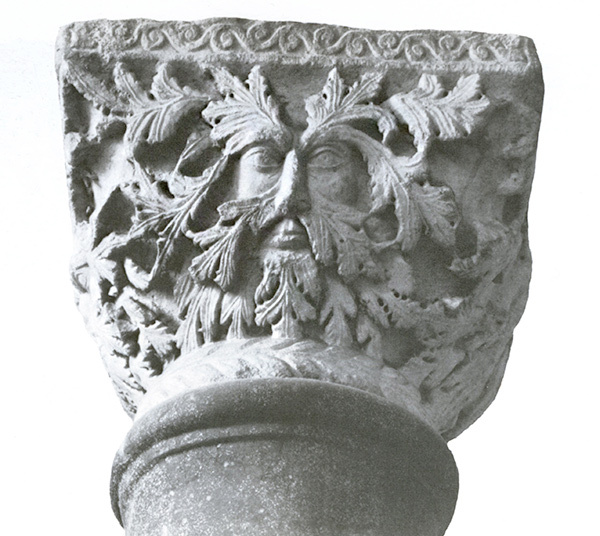 The Green Man appears to have gone out of use in Byzantium by the end of the eighth century, though it remained popular in the Western world, appearing in a wide variety of forms. No two Green Men are the same. 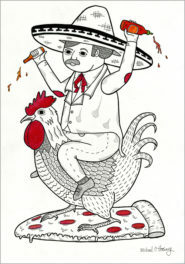 Early examples take on a more grotesque appearance, while later ones feature more playful imagery. 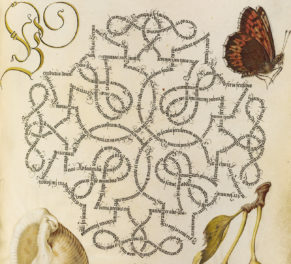 The form of the object in Heaven and Earth, in which the leaves form a mask that covers and blend seamlessly with the face beneath, appears first in the thirteenth century, making it one of the earliest known examples of this type. The slight smirk or sly smile infuses the image with a sublime quality that makes it as appealing today as it was in the Middle Ages. After the Byzantines recaptured Constantinople in 1261, many Latin monasteries were abandoned as Western-held lands were returned to imperial control. By 1276 the Cistercian Order had all but left Greece, maintaining a single monastery at Daphni (outside of Athens) and on Crete. Bereft of its brethren, Zaraka quickly fell into ruin. 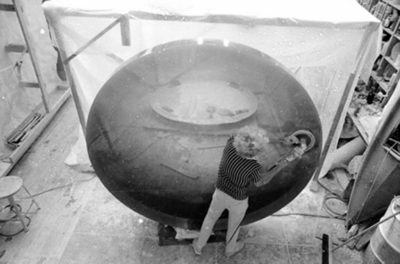 Its remains have come to light in recent years through the diligent work of members of the Canadian Institute in Greece. Long after the Crusades, however, Western influence persisted in the Byzantine world. Decorative masks on the walls of Byzantine churches recall the Green Man who once gazed down on Western monks. 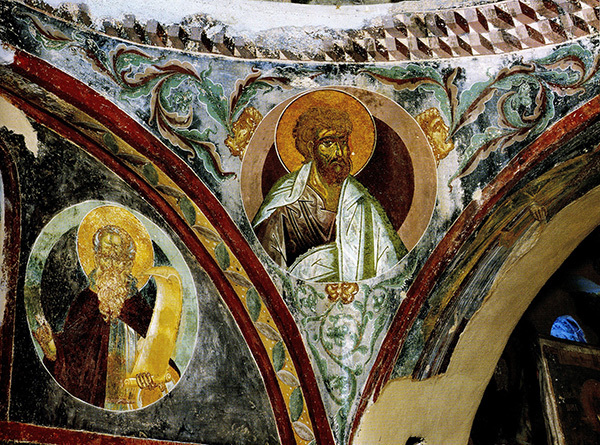 In the fifteenth-century church of the Virgin Pantanassa, one of the last churches built and painted in the city of Mystras, Green Men rendered in profile surround a saint—another example of the foliate man’s varied guises. Fresco in the church of the Virgin Pantanassa in Mystras, Greece. Foliate-faced green men surround the saint at center. Text of this post © Mark Pawlowski. All rights reserved. I received my BA in history and classics at SUNY Buffalo in 2011 and am currently working toward my PhD in medieval Byzantine art and archaeology at UCLA. My research interests include cross-cultural influence between the East and West and issues surrounding the daily life of the non-elite. Never thought about the Green man this way!